We take a short flight from Lisbon down to Marrakech. Sleeping most of the way, I open my eyes as we start descending and look out the window. Off to my right there is a line of mountains – caps of snow barely visible on the highest parts and a strange break of atmosphere with the top 3rd clear and the lower sections marred in a dusty haze. The wheels squeak and I’m jolted back to reality. Welcome to Morocco. Welcome to Marrakech. Welcome to Africa. We negotiate a cab from the airport. I say negotiate as we ask several people the price and match it with prior info we had and then try and find a taxi driver who will honour the price. They tell us no. Much higher. 300 Dirham when we were quoted 150. We stand firm and say no. They run to get us another driver. He gets there and starts trying to take our stuff to the boot of the big old mercedes he pilots. We stand firm again and ask price. He says 250, we argue back no. We were just told 180 you would take us for. Eventually through being bastards and not caving to them being bastards we get the agreed fair at 180. The streets are normal if a bit crowded and with the type of traffic to be expected for countries of this wealth – donkey drawn carts mixing it with old busses and loads of the old mercedes like our taxi. 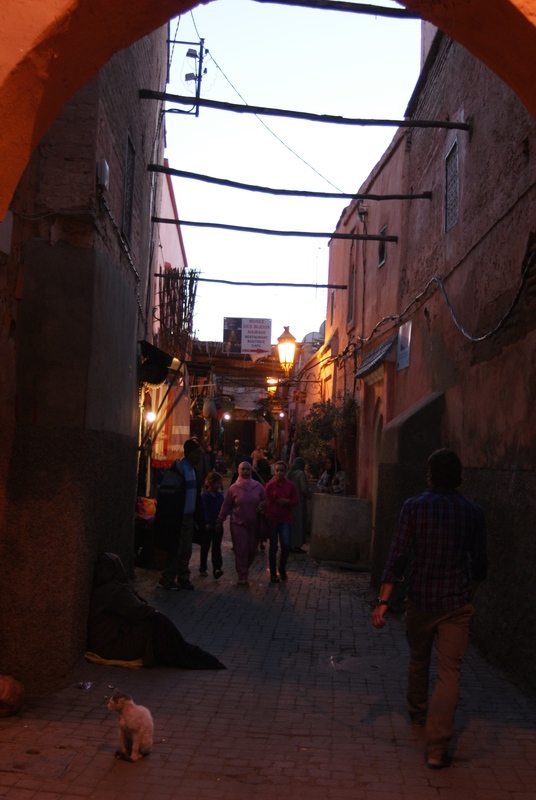 Things change when we get close to the medina. More hectic and more chaos. Loads of taxis parked up by the entrance near our Riad. We get out and once again have to negotiate our fair back to what was agreed. 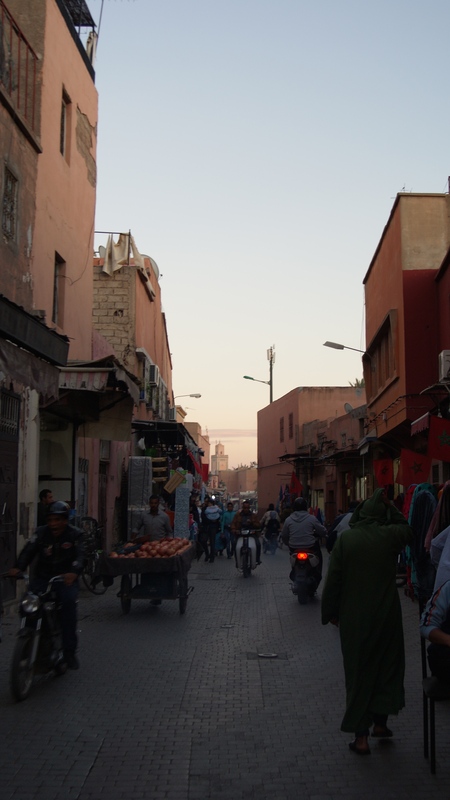 Grab our bags and leg it – a bit unfamiliar here and the medina is filled with such winding streets and an unfamiliar culture that we are both very on edge. Youths try to leads us astray telling us our riad is along way the other way. Lying bastards. They are all out for our money, but the funny thing is, if they actually told me and took me there with out the hastle Id pay them a dollar like they wanted. One particularly persistent fellow, follows us to our door, then knocks for us, despite us telling him to go away. Then he demands money from us despite having found the way ourselves. Traveler beware. 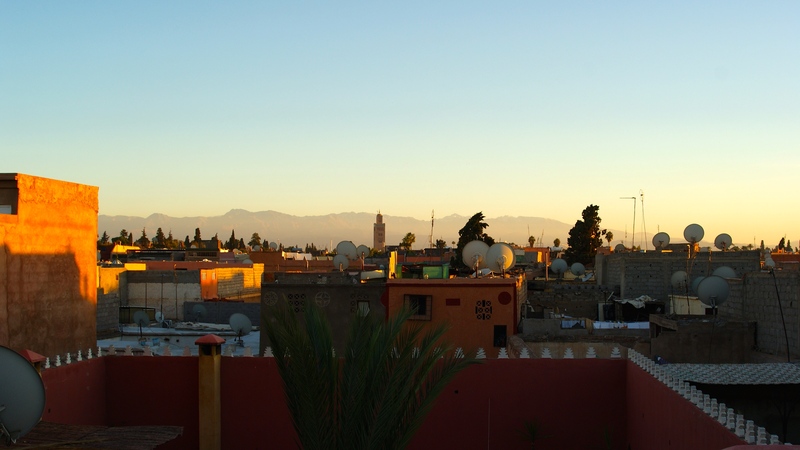 Sohba, the host of our riad, is very welcoming and we have our very first serve or Moroccan mint tea on the rooftop terrace just as the sun goes down. Relaxing and unwinding, almost nervous to venture back out into the wilderness and chaos that is the medina below. We do, as we need food and we head for the main square through along winding way and our first taste of the souks – everything and anything is on offer here, but mainly leather goods, cloths, wooden handicrafts, Jewellery and antiques are particularly in abundance, along with spice shops. We come back and explore these in more detail over the following days. 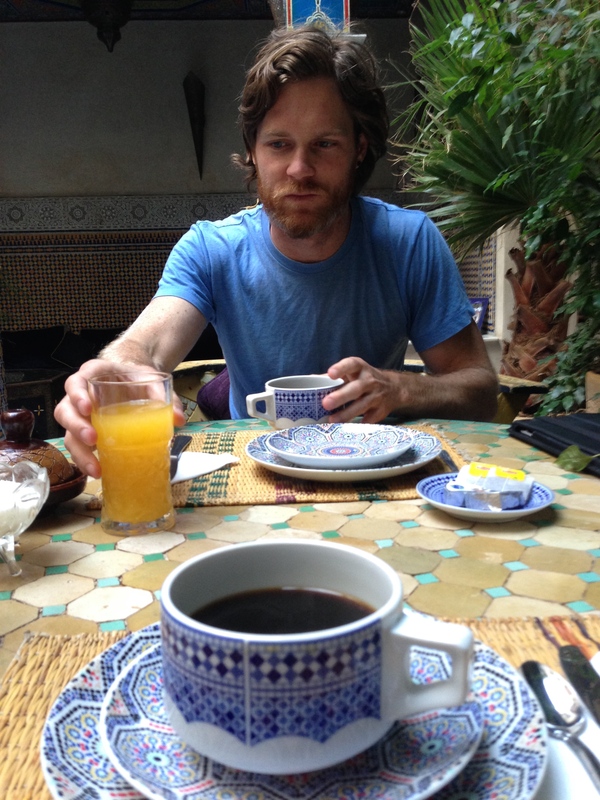 2 days into Marrakech, we plan our first adventure – its time to head for the hills. 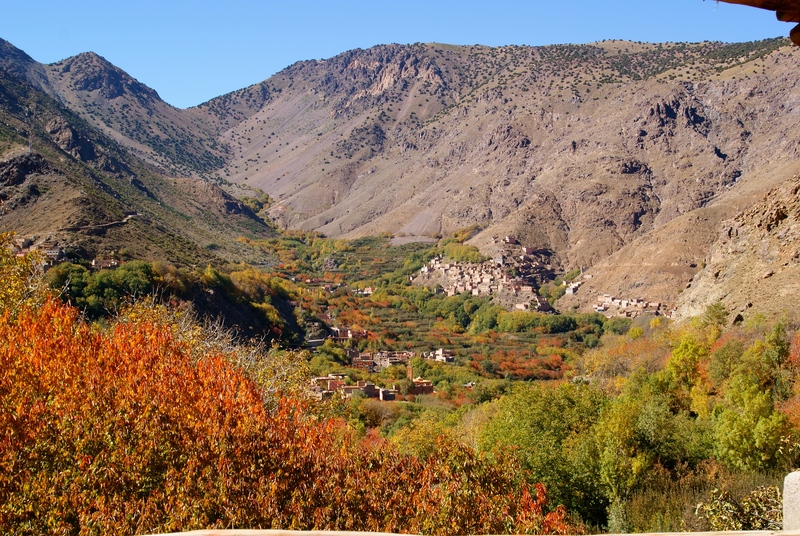 Welcome to the Atlas mountains. 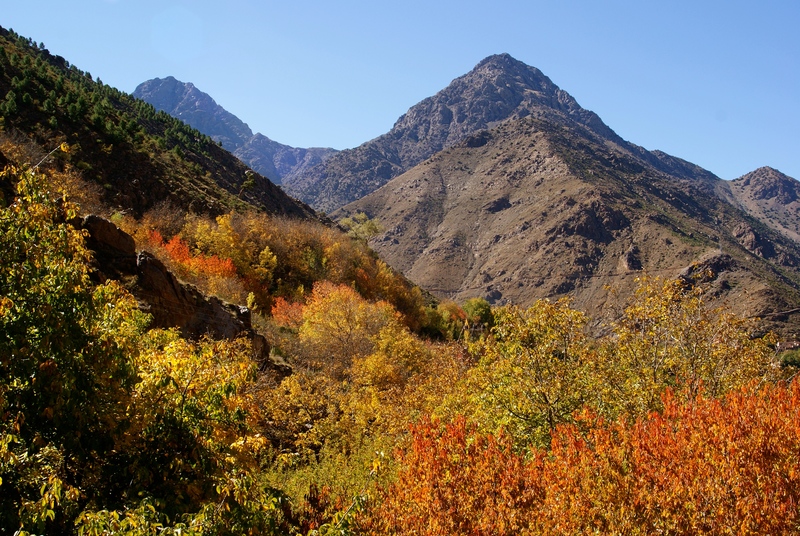 The atlas mountains are 2500km long across Northern Africa and extend from morocco to Tunisia and Algeria. With a wide variety of landscapes and habitats, they separate the coastal regions from the sandy saharan expanse. They are split into 3 sections, lower, middle and high atlas who’s capstone is the 4167m high Toubkal and our destination. 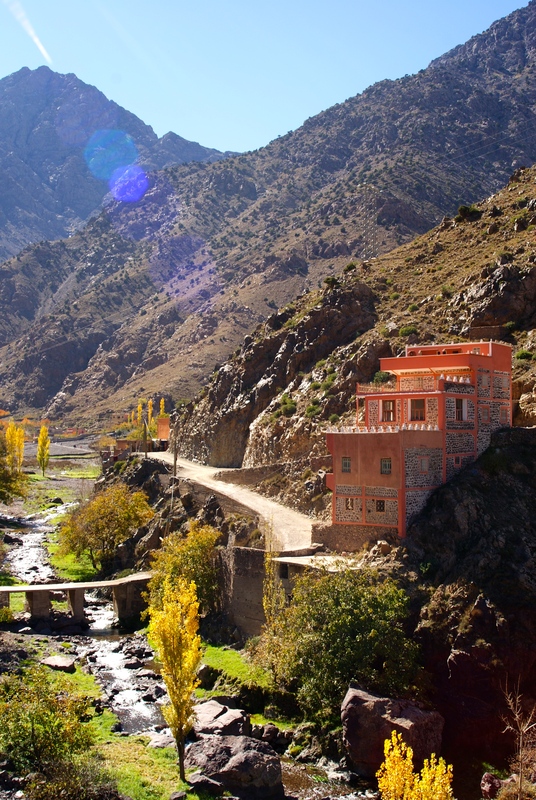 We shopped for guides and interviewed one in Marrakech yesterday morning, who has sent a driver with no english to pick us up and take us to Imlil – The main mountain village in the high atlas. Cat has doubts that we are with the right driver, though Im not too worried. After all, I see mountains out the front windscreen so at least we are headed in the right directions. The winding road steepens and we pass apple orchards and organ oil cooperatives as well as the odd old Kasbah. Kasbah’s are old fort like houses, usually the centrepiece of the village and built by the Berbers to protect them selves against Touareg nomads and most likely invading christians and muslims. We cruise the final stretches through the streets of Imlil. It takes me back to my time in Nepal – mountain villages are all somewhat the same. 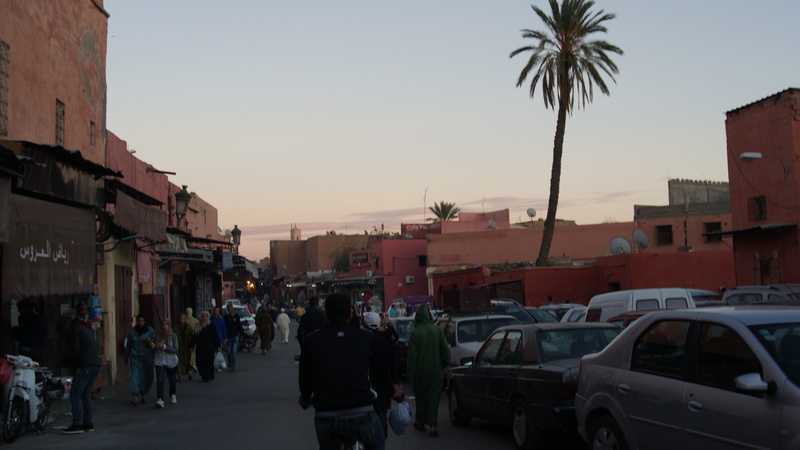 With the tourist income, trekking shops and assorted riads pop up along with and restaurants to accomodate them. Theres a whole sheep hanging in one of them ready to be carved into the days dishes. There’s the token gaggle of goats wandering the road and of course, a handful of stray chickens. We step off at Ahmed’s guest house – Dar Tigoulah, perched in a nearby neighbouring village a km above the town centre the place is furnished with rustic, very rustic, yet modern western ammenities and has the most splendid rooftop terrace overlooking the valley. Its a moment of awe to stand there, mint tea in hand surveying the rugged mountain landscape and the call to prayer starts up. Shivers, spine tingling shivers creep upon me. Taking me over and leaving me electrified as I stand in stunned silence as my senses soak up the mystical experience. The prayer calls are all different, and while we make out the Allu Ahkbar’s the rest is a mystery. What is not is the quality and tone of the voice. Some positively shriek it out like a mad banshee possessed of demons, and others, like the man on this day, in this mountain valley, crooned it out smoothly and with almost a hint of pained sadness. And as it echoed through the valley, I could feel the inspiration it would endow in the local populace as it had me. 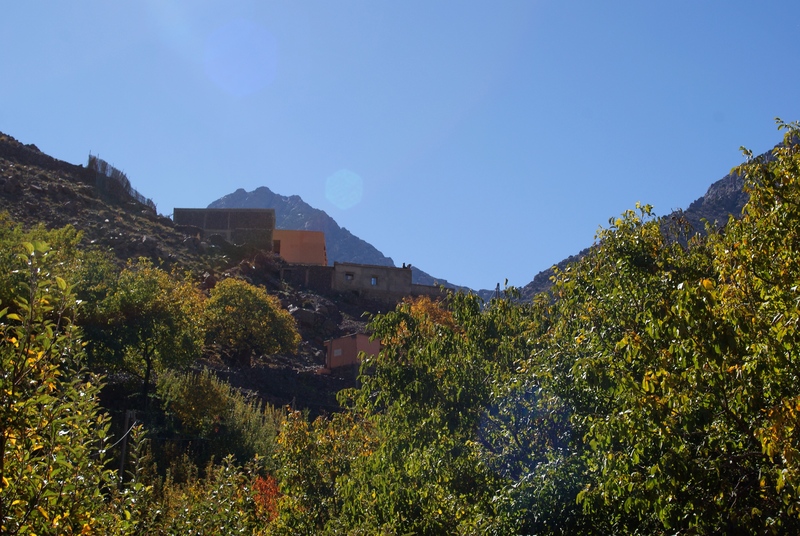 We plan our trek – 6 days in total with the first 2 days to be the trek unto Jebel Toubkal – the Toubkal mountain refuge, then our assault on the summit at 3am so we are up there for sunrise and then all the way back down to Imlil. Followed by a few days exploring the neighbouring villages.